Curly in the City: starting to grow! Wow, you never know how run down you are til you stop! I push myself hard at work and in my personal life, so I had no idea how exhausted and tired I truly was - after going going going these past few months. Didn't realize it until these past two weeks of naps, sleeping and relaxing. For the past four days straight (and honestly, essentially since 12/24) I have been resting and relaxing and eating and laughing with family - and it was just what the doctor ordered! 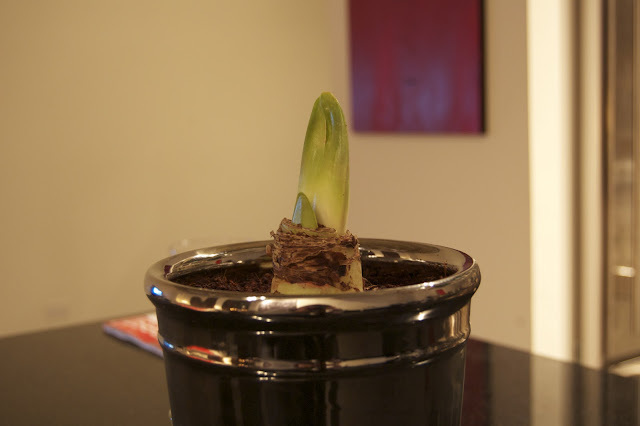 Meet Matilda my Amaryllis - hope she blooms soon!!! I am now fully rested, recharged and raring to go! I am optimistic and hopeful for a positive coming year! Fresh blooms for a new year! The Hubs and I had an epic NYE (of course I neglected to take pictures of my little dress!) - we rang it in alongside great friends. We turned a living room into a raging dance floor and rocked out well into the wee hours the next morning! A smashed in car window didn't rain on our relzxing-hangover-parade. Naps made up for the frustration! I am excited to see what the year holds and I am equally excited to share my adventure with all of you!!!!! xoxo- to another great year dolls! I am so sorry to hear about the smashed window. I wonder why people do this. It used to be a recurring event when I lived in Baltimore and the worst thing was that they didn't even steal anything. They would just smashed the windows for pleasure. T, wishing you amazing things in 2011! So glad you had a fab New Year's (minus the window of course) and got to chillax! You know it is so easy to forget that we are only human. Rest and relaxation are a must. Exhaustion is inevitable and our bodies need to be cared for. So sorry to hear about your busted car window - you seem so upbeat and positive about it, though, that you must have had an INCREDIBLE NYE! Wish I could've had some 'a that! Happy New Year Lady! Here's to a great year! starting to read the recent posts of your blog, now! happy new year lady! we need to get out there and brave the cold for another coffee. what dress did you wear on NYE? !